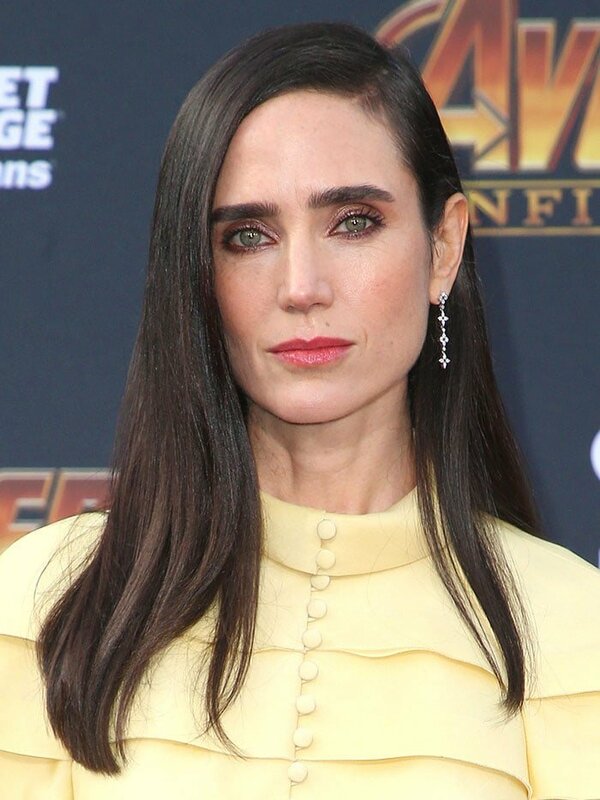 Jennifer Connelly came out to support husband Paul Bettany at the “Avengers: Infinity War” premiere held at the El Capitan Theatre in Los Angeles on Monday night. She joined Scarlett Johansson on the purple carpet that was teeming with big-name Hollywood celebrities from the Marvel superhero movie franchise. 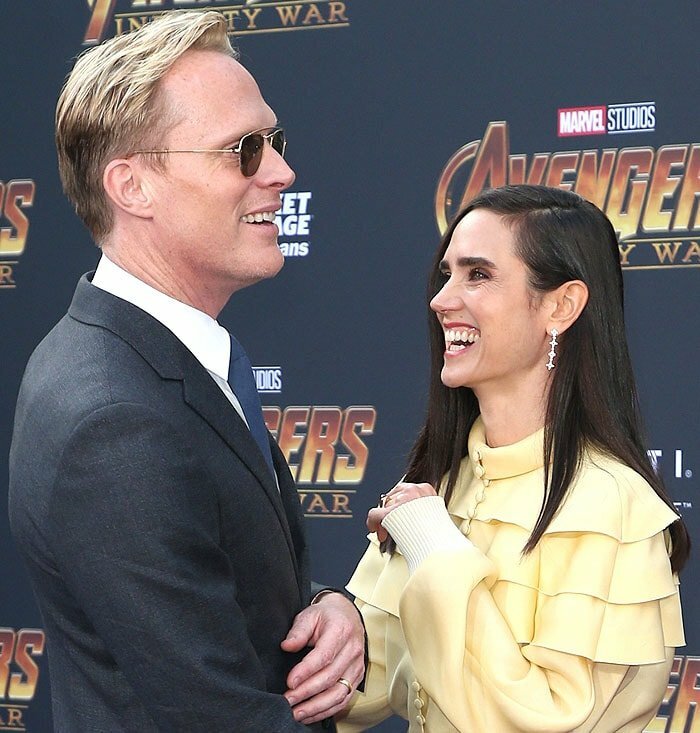 Husband-and-wife Paul Bettany and Jennifer Connelly pose and laugh together on the purple carpet at the “Avengers: Infinity War” premiere at the El Capitan Theatre in Los Angeles, California, on April 23, 2018. Although not part of the movie herself, Jennifer stole the spotlight away from her husband in a head-to-toe Louis Vuitton Fall 2018 ensemble. She got all the photographers’ attention in a ruffled, lemon-yellow long-sleeved blouse paired with a silver-belted black-leather skirt. She added her signature edgy vibe to her look with her side-parted raven hair and her famous dark eyebrows. 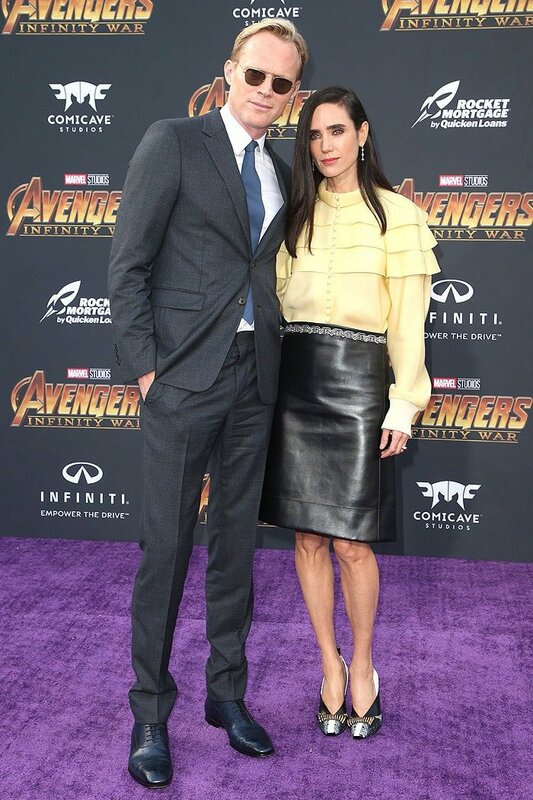 Jennifer Connelly in a head-to-toe Louis Vuitton Fall 2018 look at the “Avengers: Infinity War” premiere. The most scene-stealing part of Jennifer’s outfit for us was, of course, her unique pair of shoes. Also from the Louis Vuitton Fall 2018 collection, the square-toe, chunky-heeled pumps feature mixed-media paneling of black-and-white python and calf leather. On the toes are ribbon-shaped black-leather bars wrapped in gold metal coils. Details of Jennifer Connelly’s mixed-media, black-and-white paneled pumps with gold-metal-wrapped bows on the toes from the Louis Vuitton Fall 2018 collection. Jennifer Connelly has always made interesting footwear choices. Do you love her taste?